Taking care of your lawn is important if you want to be able to enjoy a functional, healthy green space. The key ingredients for getting the results you desire are sunlight, water and nutrients. While many lawns, especially those using drought tolerant grasses, can get by on the water and sunlight provided by nature alone, many residential soils are lacking in essential nutrients. Even healthier soils can develop nutrient deficiencies over time. That’s why it’s very important to consider maintenance practices that reintroduce nutrients into your soil such as topdressing with a rich soil, grasscycling and fertilizing. Nitrogen (N): A major component of chlorophyll, crucial to the process of photosynthesis. Nitrogen fuels plant activity, keeping your grass looking healthy, vibrant and at its greenest. Phosphorus (P): Stimulates root development in plants and also increases the strength of the stock, making it a crucial nutrient in the establishment of any plant. Potassium (K): Essential to growth, reproduction and overall plant health. Potassium protects your plant against stress damage and helps to increase water retention – lowering your irrigation requirements. The numbers on the bags (NPK) show the actual proportion of each ingredient in the specified blend. 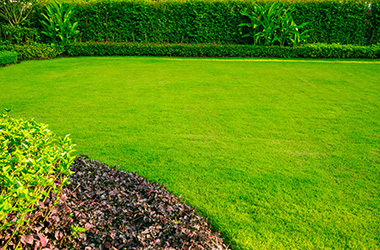 When released in large quantities, nitrogen can be harmful to your lawn and the environment. 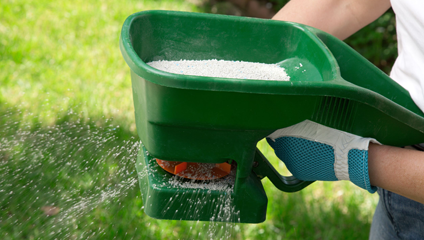 All Manderley fertilizer blends are designed to ensure a stabilized release of nitrogen, to avoid soil pollution and damage to your lawn, as well as optimizing nitrogen’s lasting effect. Manderley has created a full line of fertilizer formulas to provide your lawn with the right blend of nutrients for best performance, at any time of the growing season. Root Starter: For newly sodded or seeded areas, rich in phosphorus to give grass the best possible start. After all, by ensuring your lawn starts out healthy, you are helping to prevent problems down the road. 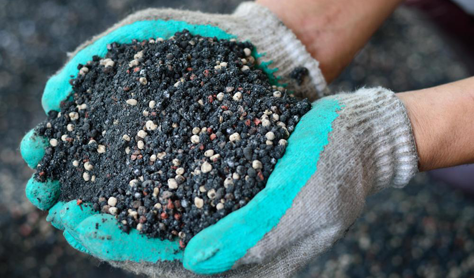 Manderley’s 3 Step Maintenance fertilizer program does not contain any phosphorus which, when not being utilized, can remain in the soil and runoff, causing environmental problems. While phosphorus is highly beneficial during the establishment of new grass, it does not need to be applied regularly to a mature lawn. Spring formula: A nitrogen boost to stimulate rapid green-up and Spring activity after winter dormancy. This blend will also help your lawn achieve early season green colour. Maintenance formula: Designed to see your lawn through the tough summer months, this balanced blend of nitrogen and potassium minimizes water loss, reduces the impact of warm weather related stress and helps plants remain active and retain their green colour. Fall formula: Designed to prepare your lawn for the harshness of Canadian winter. This potassium rich blend will improve your lawn’s winter hardiness and reduce the risk of complications in Spring. Don’t make the basic mistake of applying fertilizer with your bare hands! Not only is it inefficient, but it will also result in an uneven distribution, damage to your lawn and waste of both money and effort. Using a mechanical dispenser is the best way to ensure that the fertilizer is spread evenly, to avoid burning and to optimize results. There are many types of mechanical dispensers on the market: convenient and affordable handheld types for small or irregular areas, as well as wheeled models for larger lawns. Take the time to choose the dispenser that fits your needs and your budget.